This issue of Asimov’s is the second consecutive one with stories by Rusch and Rucker and the second with a double-barrelled shot of Gunn (sixth with at least one Gunn). The average quality is reasonable and there’s one or two notable stories but little sticks out significantly either way. One thing that does stick out is that, while there’s nothing here that’s strictly fantasy, there’s quite a bit that isn’t strictly SF in one sense or another. Two stories are essentially fantasy. “Seven Months Out” features a woman who’s lost her husband, is expecting a baby, and works on a ranch where some of her cows are also expecting. Almost half the story is her hallucination, vaguely rationalized by maybe-aliens. Some few may respond to its thick (indulgent) emotional content. “A Threnody for Hazan” spends much more (too much) effort reinventing the wheel of a surreal spiritual time machine which lets a protagonist become a wall or road in WWII (which turns out to have more resonance than might be expected) but what it really wants to do is describe the relationship between an interesting and strange couple and to address all the awful things that make up history and humanity. It’s not bad but probably would have have been better if it had been a straight fantasy. Two more pieces are arguably thickly cloaked medieval bits but the “pieces” and “bits” are more significant. “The Waiting Room” is a fragment of a prologue to “Attack on Terminal” which is, itself, a fragment of a prologue to the Transcendental books. Riley, his AI implant, and some fellow pilgrims are trying to travel to the Transcendental Machine. A brief attack by alien barbarians punctuates what is otherwise just Riley’s looking at and thinking about his fellow travelers. “Dix” is indubitably an SF novella but of a TV sci-fi sort where technobabble problems and solutions fail to provide tension and the reader spends most of the tale waiting for the other shoe to drop but there’s only one shoe. A ship was stuck in foldspace for 5,000 objective years and has recently emerged. The protagonist and her captain find the first officer dead of an apparent suicide and have to deal with the threat this may pose. Next are a pair of actual SF stories featuring bent brains. “Love Songs for the Very Awful” is one of Reed’s recent run of dyspeptic tales with anticlimactic endings but has elements of interest. A scientist has escaped from her small town and is running an experiment which models personalities by permanently implanted brain meshes. A sociopathic sort of a person is among the first test subjects which means that, when the tech has advanced and people are modifying their personalities, he can’t modify his. The tale deals with those two characters’ relationship with each other and his with another woman later. In the other tale, Scott’s “Emojis” don’t just go viral, they are viral. At the behest of his boss, he infects himself without knowing he’ll be contagious. So the whole world gets little empathy-based icons floating in their visual field and they can be used for advertising, too. So Scott decides to take it a step further. Entertaining enough but not as momentous as it seems like it should be. Fans of Simak and/or anthropology might be most likely to enjoy “Bury Me in the Rainbow” which is a “stand-alone sequel” to “We Will Drink a Fish Together” (which I have read and recall enjoying but can’t recall otherwise). In this one, Tony takes over for the recently deceased Sam and is in a power struggle with a calculating and aggressive woman who thinks Tony is too trusting of the aliens who are offering some of Tony’s tribe passage on their ship. The off-the-cuff, incidental characterizations and observations are probably the best part of this. The story’s not overwritten or exactly padded and there are a lot of details and complicated parts but the basic story doesn’t seem to require this very long (34K) novella which resolves fairly predictably and clearly indicates another installment is coming. It’s done well enough and of enough substance to merit some attention, though. Finally, I recommend “In Event of Moon Disaster.” Laurie and Sol are alone in a region of the moon after something has struck the surface. Laurie had gone out to investigate and has now returned. Sol lets her in and she goes to sleep. Then there’s a knock at the airlock. Laurie’s banging on the ship and wants to come in. This story riffs on all sorts of things from “The Brain Stealers of Mars” to “Knock” to “The Cold Equations” and “Think Like a Dinosaur” and more but you don’t need to be familiar with any of that to be weirded out by and interested in this story which also displays a grasp of twists and scale. Since this is set in one continuum, I don’t know if it also means to be addressing one of my biggest gripes with the “many worlds” conjecture but, if so, I like that, too. It’s a new year and the January webzine stuff is coming out and now this blog can officially begin. 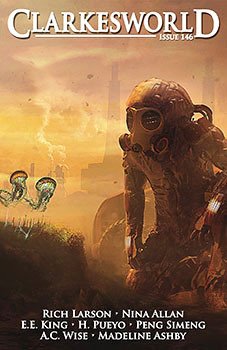 I’ve read Flash Fiction Online, and a tale each from Apex and Clarkesworld. The latter produces the first (mild) recommendation of the year. Silas, his sister Haley, Io the muscle, and Yorick the suit are sent by their company to examine a bioship that’s gone silent. Haley dies from micrometeorite damage to her cryo chamber in transit with only a deteriorating software backup of her consciousness remaining, which Silas is determined to save. Their troubles have only just begun, though, as they enter the ship to find the “bio” part has run riot and the controlling software, having become sentient due to the flesh/machine hybrid, is even more out of control. The previous crew appears to have been eaten to provide some of that increased biomass and the new arrivals try to avoid being next on the menu. This is a gothic space opera and, if you like the first Haviland Tuf tale of George R. R. Martin or the Boojum tales of Sarah Monette and Elizabeth Bear or many Alastair Reynolds or most Neal Asher stories, you may like this. It does have problems: it places too much weight on the Turing test and isn’t very plausible when it comes to computers and AI (from Haley’s inexplicably decaying software to the fact that the AI is supposed to be easily distracted (because if our contemporary computers can’t process millions of instructions per second and can’t multitask how is a futuristic AI supercomputer supposed to? )), and the ending may not surprise everyone, but it’s effectively creepy and full of fast-paced excitement with a believable and interestingly quirky but Ordinary Joe protagonist.